Last week we posted a story about how the new flagship Microsoft phones had been reduced in price even before their release. 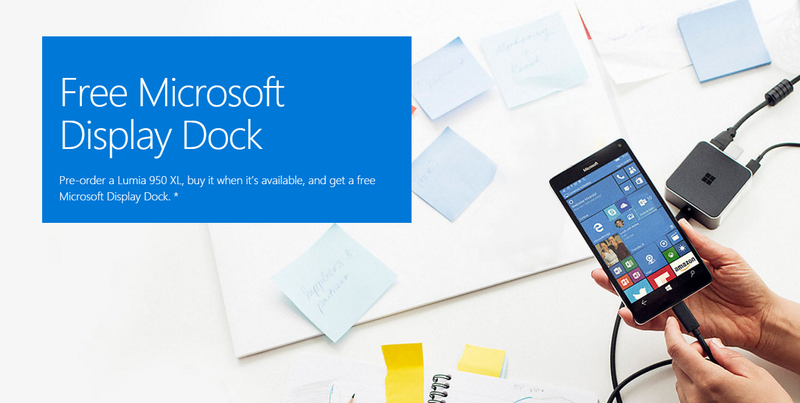 If that wasn’t enough to tempt you, Microsoft are now offering a free Display Dock to anyone purchasing a Lumia 950XL through its website before the end of January 2016. The Display Dock is the nifty little piece of kit that will connect the Lumia phone to a keyboard, mouse and monitor to allow you to use your phone effectively as a PC. It hasn’t been officially priced in the UK yet, but if overseas prices are anything to go by, the Display Dock should sell for around £65 ($99 in the US). The 950XL is currently available for pre-order for £529.99 here, while details of the dock offer is here. The Lumia 950XL is expected to ship in early December.